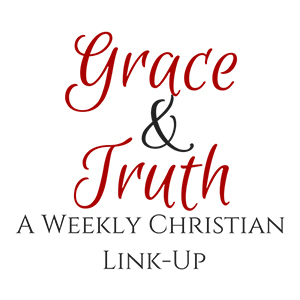 I am happy to be making my way back into a normal routine and participating in the Grace and Truth LinkUp. January was a busy month for me and a truly blessed month. I had the privilege of traveling to Washington DC to participate in the March for Life with a large group of youth. It was positively an incredible experience that none of us will ever forget. I felt the presence of God with us throughout the March. I was blown away by the number of youth at the March- I can’t help but believe that they will be the generation that will be the voice of those who have no voice and end abortion. NOW FOR THIS WEEK'S LINK UP! LET'S BLESS AND ENCOURAGE ONE ANOTHER IN OUR WALK WITH THE LORD. Grace & Truth exists to point people to Jesus! We hope this link-up will be a source of encouragement each and every week. If you're a blogger our hope is that you'll use this space as a way to meet new friends within the Christian blogging community. If you're a reader our hope is that you'll meet new bloggers that love Jesus just as much as you do! Most of all, we hope you'll meet Jesus here. 2.) Leave 1-2 of your most recent CHRISTIAN LIVING posts. Please do not link DIY, Crafts, Recipes, etc. Links of this kind will be deleted. We also reserve the right to delete posts that don't align with the theme or that are deemed by the hostesses to be inappropriate. 3.) Visit 1-2 other links and leave a meaningful comment! We want to encourage community, so please don't link and run! 4.) All links are randomly sorted - feel free to link as early or as late as you'd like. The playing field is even!